VISA! Coming out of a Heartcore reformer pilates class at 7am, smiling at the bright sunshine as I walk down the hilly, charming Hampstead high street, debating whether to jump on the tube in Belsize Park or just walk the whole sunny way through Camden and along Regent’s Canal to Kings Cross, I receive a photograph from Sanoop. Of his smiley face, a house he drew, and a page in his passport. Across that page, in big letters, it now says that he is my family member. The feelings of joy, relief, excitement and love are indescribable. Weeks and weeks worth of admin, uncertainty, him being without his passport and not knowing when he’d get it back, practicing patience, hoping and missing each other have now come to a happy end. He can come home – we can start our lives together in Hampstead, London, England, the UK, Europe. He books a ticket for next Tuesday, the 19th. I’ll pick him up in Heathrow at 4:55am. Meeting My Friend’s Newborn Baby. After work on Thursday, I pick up a bouquet of dark blue nettles, order food from Rosa’s Thai Cafe in Chelsea, jump on the tube to Gloucester Road and skip down the swanky stretch to pick up my order and continue a bit further along the same road to knock on my friends’ door and step inside to give them big hugs and meet their beautiful little daughter, who came into this world last Tuesday. All three of them are happy and healthy, oozing harmony and love. Lots of cuddling, recount of delivery story, talk of those huge emotions and the newsness of it all, eating, and dreaming. Soon we’ll all go for a walk in Hampstead Heath. Yay. My Gran’s 90th Birthday in Denmark. I asked her what she wanted to do for her big day. Visit us in Singapore, she said. But then we moved (well, technically Sanoop is there for a few more days), and she’ll come back to London some fine summer’s day, I’m sure. She threw a big party for family and friends (the few friends who haven’t passed yet!) 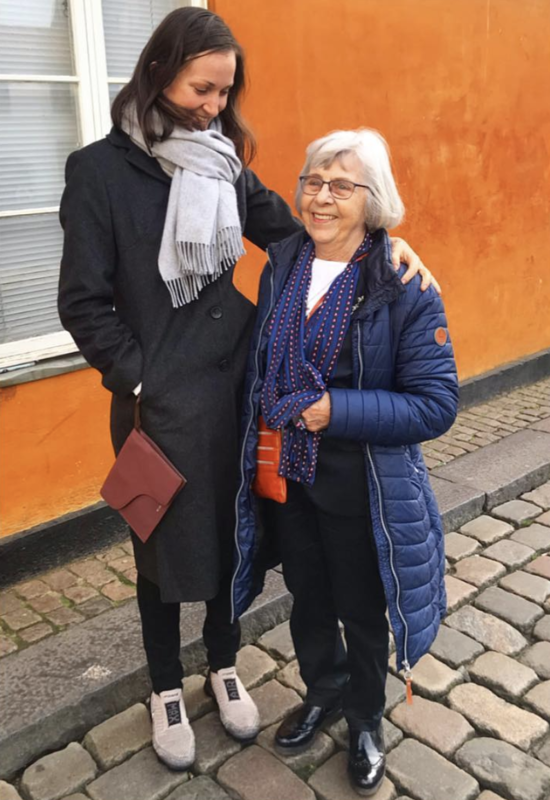 on her actual birthday, but when I was in New York, So, for now, we celebrated with a sunny Saturday out and about in Aarhus. The exhibition, Freedom’s Workshop, at the natural history museum, on our hero, the seafarer Troels Kløvedal’s adventurous life circumnavigating the world multiple times and engaging with much zest and curiosity with everything and everyone he met (much like this lady). Delightful lunch at charming Landcafé. Coffee from La Cabra. The splendid view from Salling Rooftop. A bit of shopping. Relishing the bright Spring-like weather and vibes – what I love about Denmark; the air is balmy, the skies are clear, and so of course EVERYONE has dotted their sunglasses and stepped outside and are drinking rose and aperol spritz at outdoor cafe tables, stoops and benches, wrapped up in scarves and beanies! Lots and lots and lots and lots of chatting (I did the listening, nodding and smiling). Smaller Stuff. I keep burying myself in the newly uncovered diaries from my teenage years – so many emotions, so many, such big thoughts for such a young head, haha … I care so much about this girl … it’s a perfect exercise for nurturing self love … I made life extremely tough for myself back then, put pressure on myself in all aspects of life — out of lack of outer pressure, out of boredom, out of longing … deep love of my family… deep reflections on the good way of thinking, being, living… Just really great stuff to bury myself in on late winter evenings home alone, haha. // One evening, I host a real dinner at the flat, inviting over my two closest colleagues. It feels very nice – just one of those little milestones to warm a house. Now that we have a dining table. // Another night, I meet two old Danish girlfriends for dinner, enjoying that this is possible now. // I buy 30 classes at Heartcore. It feels extremely indulgent, seeing as I can train for free at the lovely, spacious, bright gym at work. As much as I really wanted to give that a go in the beginning, though, there just is some sort of resistance within me: mental work and physical exercise are two different things to me. They require physical separation. Also, if this is THE only luxury thing that keeps haunting me; I love reformer pilates, I love the idea of a local gym, where I can just jog over from home and potentially meet local friends… then so be it! I go for early morning classes on Tuesday and Thursday and really love it. // On the 14th, I receive a big box of beautiful red roses from my Valentine, who shows me that every day and the whole world is full of so much love. // The weather is gorgeous these days — I walk or cycle to work in glorious sunshine and fresh, crisp, fragrant air, listening to podcasts and talking to my mum on the way. // Quality time with my family. I work from home, in Denmark, on Friday, my parents being home as well. On Friday night, we have dinner with my brother, and on Saturday night and Sunday we live in this bubble of family happiness by the beach in Juelsminde.